In the last few years we have seen a tremendous gain in the popularity of pedal assist bikes, or e-bikes, at the shop. Specialized had been making electric models for quite some time, but when I saw what the latest version had to offer and the level of refinement, I knew we needed to bring them in to the shop. These bikes are a blast. They look like regular bicycles, and ride like a normal bike, but feel like you have a tailwind everywhere you go! All of the staff use them daily for running around town, and our customers have been putting some serious miles on them. It’s really opened up possibilities for riding. For some, it’s making an 8 mile commute manageable more days of the year without having to get to the office sweaty and smelly; then turn the level of assist down for the ride home to make it a bit more of a workout. Others have been able to cover more ground than ever before, and overcome disproportionate riding abilities, making rides with friends and significant others possible as they weren’t before. They are definitely an equalizer! There are several different models. The Como is modeled after our most popular hybrid, the Roll. Super comfortable and upright, it allows the rider to take the scenery in while cruising along with assistance up to 19 or 28mph, depending on the model. The battery life is anywhere from 30-100 miles depending on the level of assistance chosen, terrain, and weight of the rider with some models coming with a higher capacity battery. We are fully equipped for repairs on Turbos, just like we are on non electric bikes. The relative simplicity of their design was a big selling point for me, as I didn’t want to have hours of labor into a bike when it needs service. The modular design lends itself well to forward compatibility. The batteries actually have empty cell bays in anticipation of greater capacity at lower prices as battery prices drop. 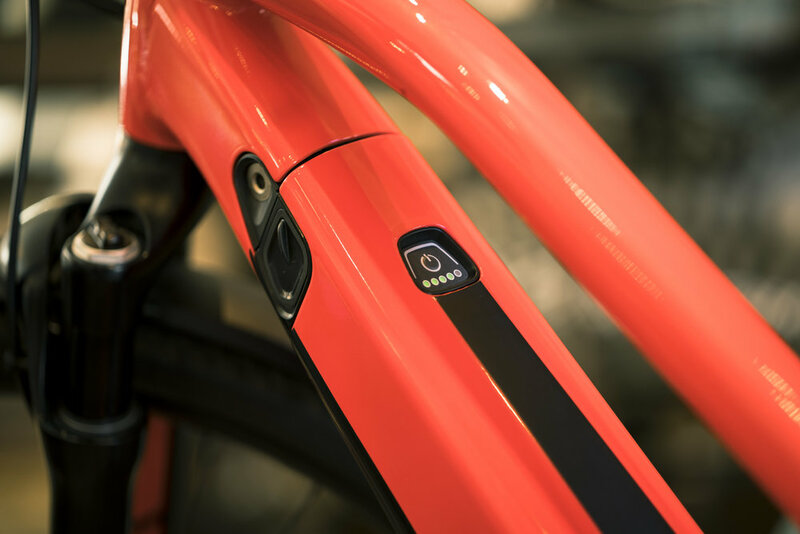 The battery is easily removable for charging in case a power cord isn’t in easy reach of a bike, and it also comes with a battery lock so it’s secure. The motor is another highlight of these. Smoother power application than other options, Specialized worked to smooth out the torque so synonymous with electric motors. This gives the rider a very smooth transition into power. It’s also very efficient and a large part of why the range is so far on these bikes. We stock a bunch of the Turbos at the shop. Come by and check them out!